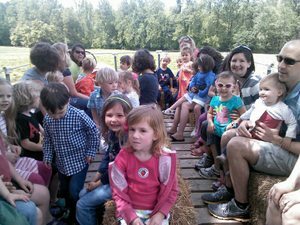 The Berry Patch is the perfect place to bring your daycare, school or church group. Enjoy a fantastic day out on a real strawberry farm, complete with an old Victorian home place, shade trees for picnics and a play area! When we open for berry season, our staff is prepared to direct educational field trips which must be requested on site the day of your visit. Please find one of our staffers, gather your children and we’ll give a talk about how strawberries grow. Picnic and play areas are also included. call (804) 795-9979 or email steve@gallmeyerfarms.com.